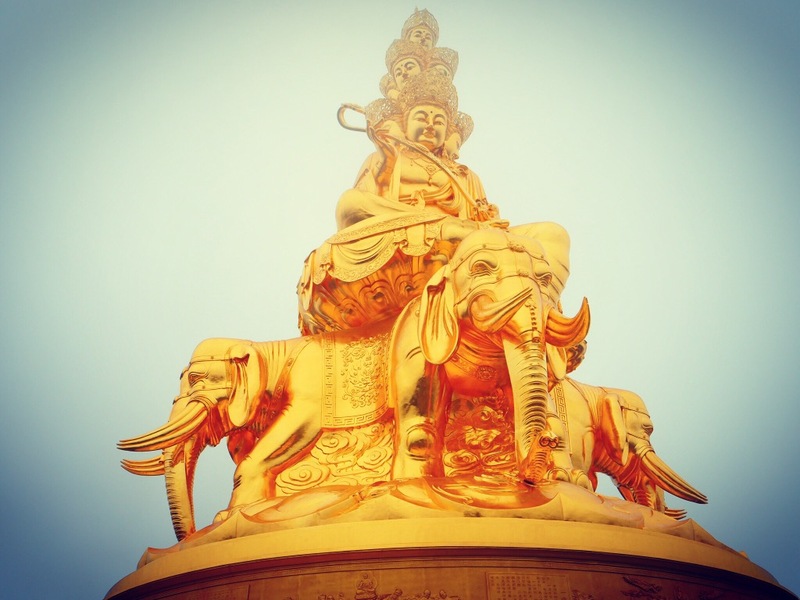 China: Kunming and Emeishan – Sometimes the wrong train will get you to the right place. After a fellow traveler came back empty-handed from the China visa office in Delhi, we were doubting whether we were going to make the cut. Our hearts were beating out of our chests as we stood at the desk of the visa officer, he was fiddling with some sort of paperwork. As he unwrapped our passports we concluded that our visas had been granted, and a weight was lifted from our shoulders knowing that we would finally be on our way. Sure enough, there were our passports, with valid Chinese visas affixed inside. We spent the remainder of the day in Delhi putting our things together and heading to the airport. We arrived in Kunming late at night and were greeted by the cool mountain air rushing around us as we left the plane. After a shuttle bus into the city and a whole lot of wandering around trying to find our hostel, we were able to check in and relax. Kunming, as we quickly concluded, was a pretty cool place. We hadn’t eaten since morning, but a night market was conveniently located right downstairs from the hostel, and it was a happenin’ joint, even on a Wednesday. We bought some beer from the shop next door and ordered some food through extensive use of hand motions. Our well-deserved first meal in Kunming. It was pretty clear that we had left the Anglosphere. Not a single person we spoke to since landing spoke any English, with the exception of the hostel workers, and even that was a stretch. It was kind of refreshing, in a way, having these people speaking to us in their language and responding in our own. We would eventually get across what we were trying to convey, and as long as we were flexible we’d be happy with the result. From time to time since then, we –clearly not of Chinese origin, mind you– have been approached by locals speaking only Mandarin with no attempt at facilitating understanding. Many of the long-term expats here learn to speak Chinese, so I guess they could think we’re some of them, but who knows. A pretty typical sight in Kunming. The food was fantastic, right off the bat. Sichuan pepper, hot chilies, noodles, and rice featured heavily, and practically any of the many streetside restaurants ended up being a good choice. 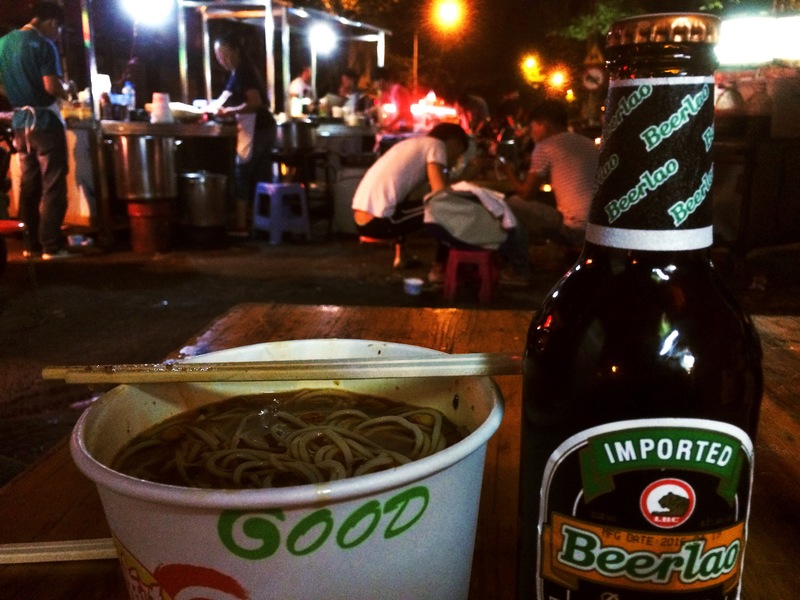 For a quicker something to eat, street food choices are extensive. Barbecue stands, for example, are super common, where you choose pre-arranged raw skewers to be grilled for you on the spot. We spent most of our time wandering around the town, simply enjoying non-40° weather. 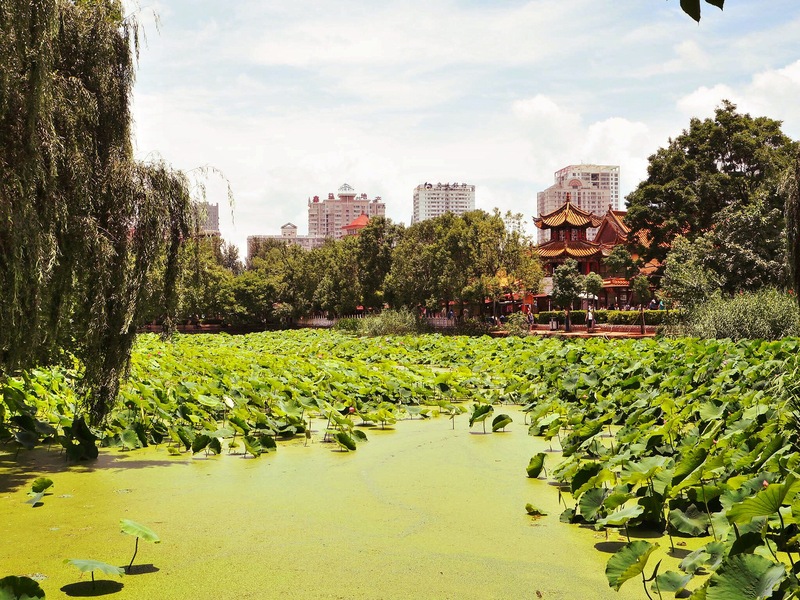 Cui Hu park, just north of the center of town, is a very relaxing place to spend an afternoon, with a maze of paths crisscrossing over the shallow, green lake. 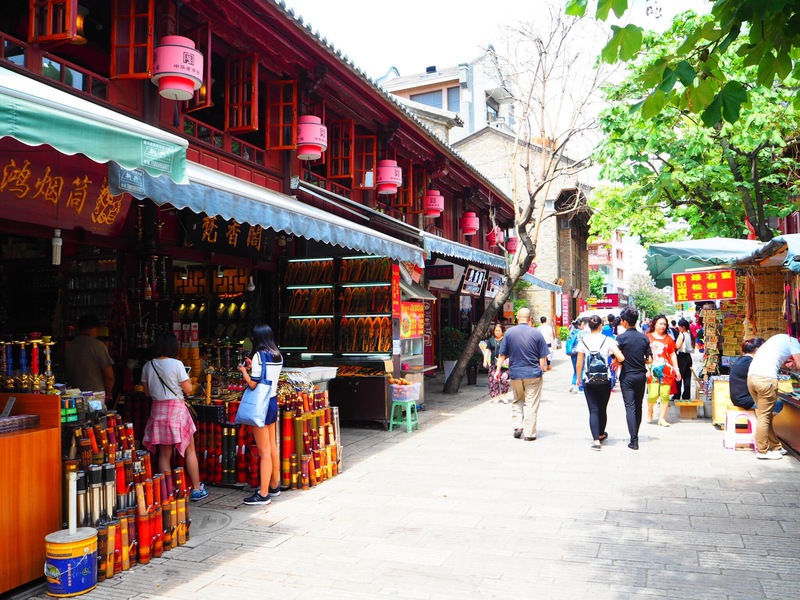 Jingxing is a vibrant and cool section of town with tons of market stalls selling anything from tea to live animals. The lake at Cui Hu park. 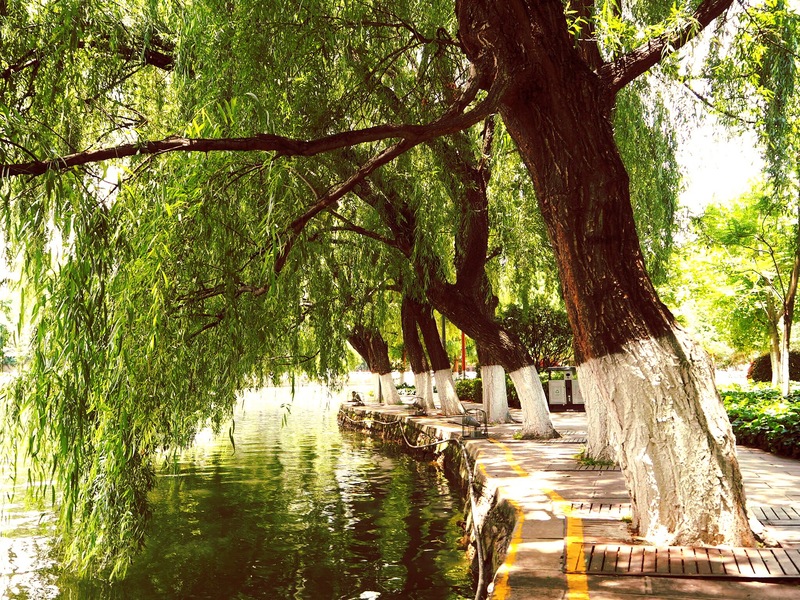 Some willows at Cui Hu. We spent our last night in town at the reportedly hip neighborhood just west of Yunnan University. It was indeed hip. We visited a few different bars, most serving warm beer with a bowl of ice (apparently you need to specify cold beer if you want it from the fridge). Just as we were planning on heading home, we ran into a group of expats (tablemates from a few bars earlier) at another bar, and they talked us into a few more drinks. The night ended late, after shots of baijiu (liquor made from various grains, but composed mostly of sorghum) and more beer. We naively assumed that the metro station called Kunming Railway Station would indeed be next to, or at least easily accessible from the actual railway station of Kunming. As it turns out, it’s no small feat getting to the railway station from the metro station, and we had to pony up for a several kilometer rickshaw trip to the actual station. This, coupled with some misleading signage and inefficient passenger handling, resulted in us missing our train by a minute or two. It definitely had nothing to do with us not managing our time properly… no, certainly none of that was had. In any case, we were left begging the woman behind the closed gate to let us on the train (which was still very much at the station), but she would stoically point to the sign that said “Ticket check closes 5 minutes before departure.” We were eventually ushered to the ticket counter and told (via a smartphone translation) to deal with the ticket officer to see if we could get a new ticket or a refund. After a long time of jostling and shoving, we miraculously met with somebody who spoke at least a few words of English. She quickly reissued our tickets for the next departure and urged “Go! Go! Only 12 minutes!” We were reminded, during this process, that we were getting seats rather than a sleeper as we had booked before. We shrugged and figured “how bad could it be?” Pretty bad, in fact. We spent the following 15 hours playing musical chairs with just about everybody else in the coach. We weren’t even seated next to each other for most of the time, and just to get to the bathroom we had to push past the dozens of people seated in the aisle. After the first stop we figured there was basically no room for anybody else, but the space became more and more cramped with every remaining stop. Needless to say, we got very little sleep, and were roused to full consciousness at about 06:00 by the shouted diatribe of one of the railway employees about what seemed to be toothbrushes. We concluded that this guy was selling a particular brand of toothbrush, but he was yelling at the top of his lungs for at least 15 minutes about it. He even borrowed our water bottle, applied toothpaste to the side, and scrubbed vigorously with the advertised brush, I guess to illustrate its effectiveness. We did eventually make it. The humid air and pre-fab look of Emeishan wasn’t very welcoming, but the neighborhood beyond the gate (inside the official national park boundary) was a bit nicer. 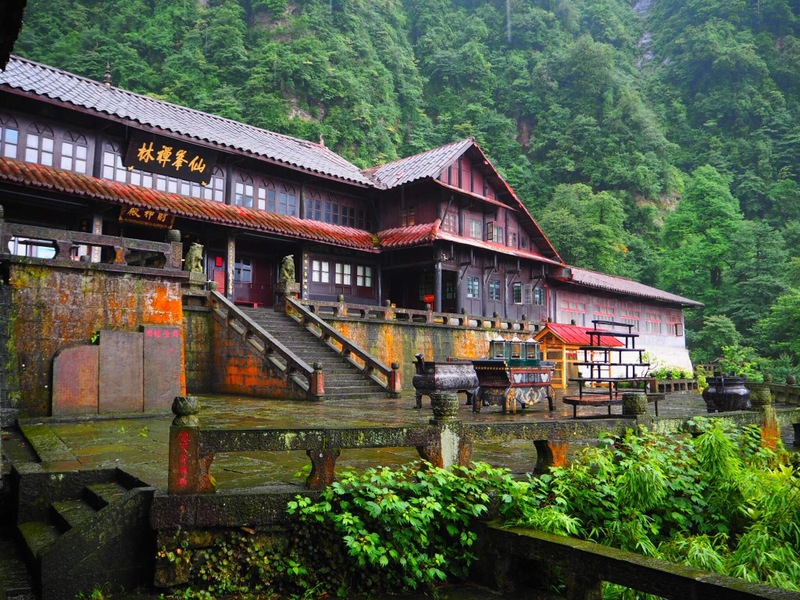 Emeishan is a very touristy place, but a vast majority of the tourists come from other places in China. 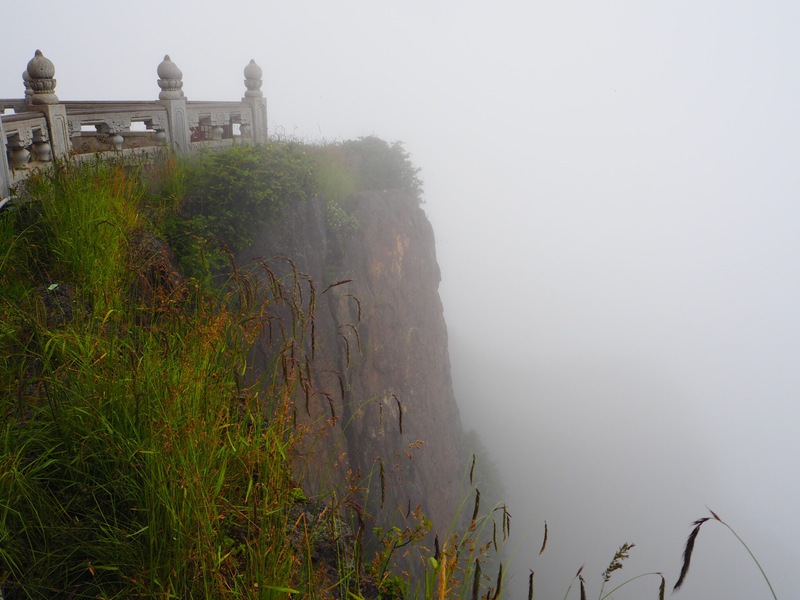 The mountain here is the tallest of the Four Sacred Buddhist Mountains of China, but due to the overwhelming tourist demand, getting to the top is exceedingly easy. 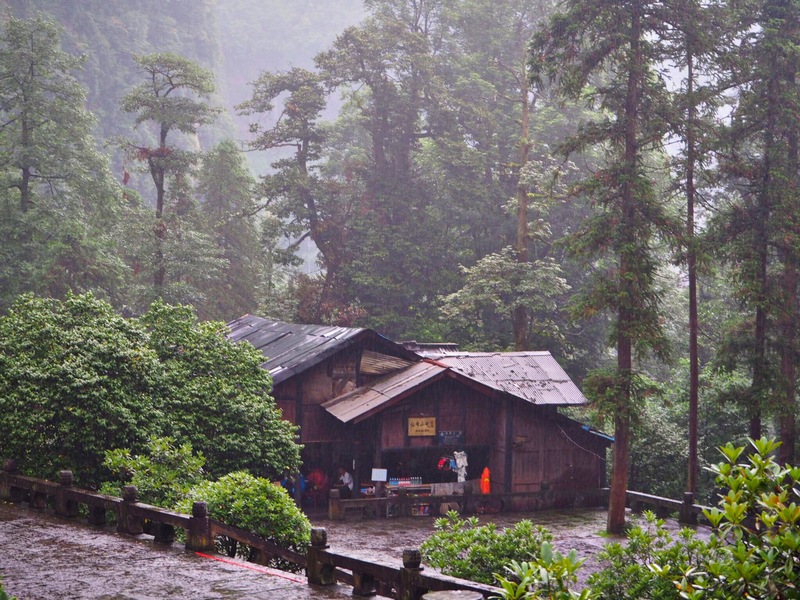 There are buses from town to Lei Dong Ping, from which it’s a short hike up to Jie Yin, which is the source of a cable car up to the summit. Our plan was to take transport all the way to the top, and hike all the way back down over two days, but again, poor signage prevailed and we ended up hiking a fair portion of the trail up to the summit after having bought cable car tickets. We turned around once we realized it could not be any farther, and eventually found the entrance not far from where we bought tickets. The famous Buddha statue at the summit. 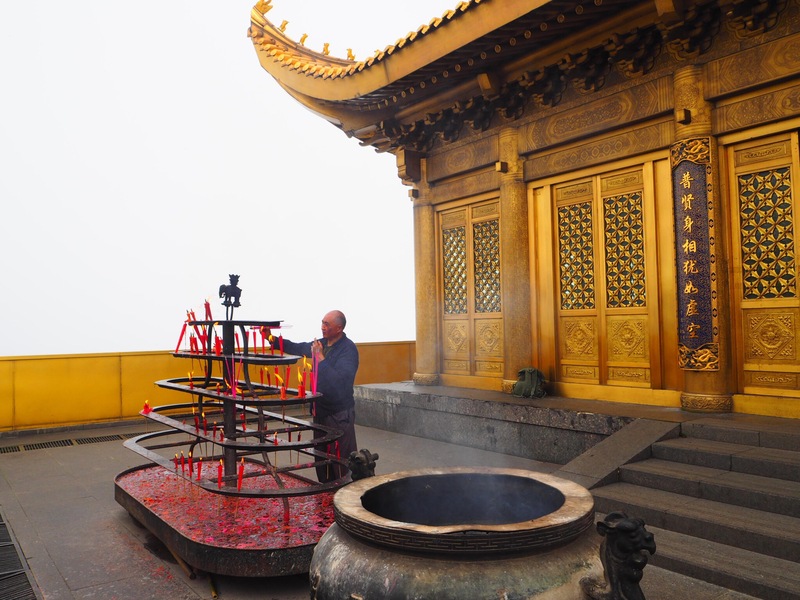 A man lighting candles at the summit monastery. The park is a pretty strange place. 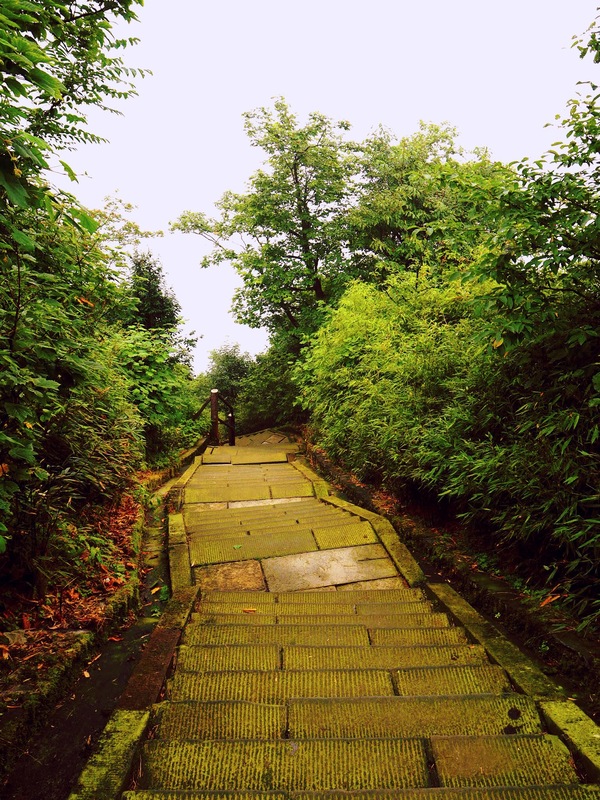 There are a number of monasteries scattered across the mountain, and they’re all connected via a very well-maintained series of stone paths. 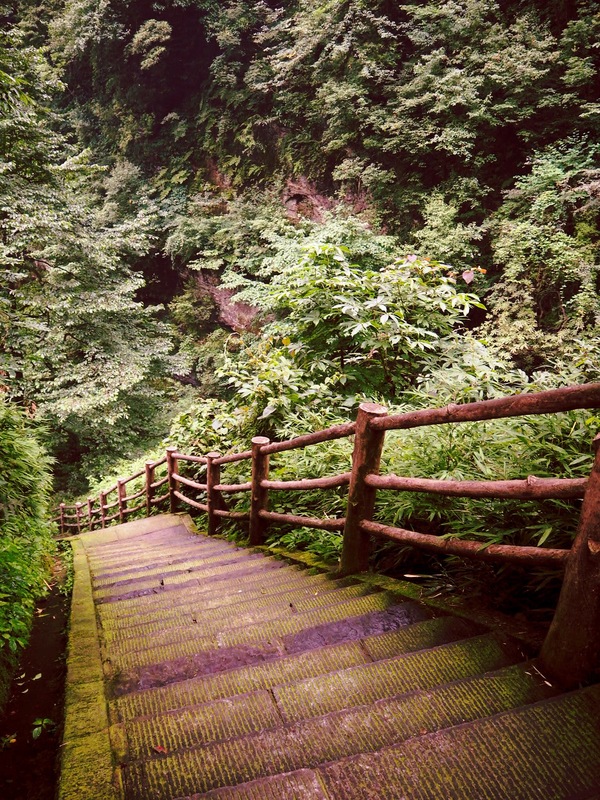 From top to bottom, we didn’t set foot on a single patch of soil; it was all stone steps. Reported distances vary wildly, several sources claim that from the summit to the bottom it’s as far as 60km, others say 40km, others still say things in between or stick to vague figures like “14 hours.” We were able to do the downward hike from the summit to Wuxian Gang via Xianfeng in two days, each leg about 10km. Most monasteries on the mountain offer accommodation, and (weirdly) there are restaurants at very short intervals along the paths, so there’s no need to pack food or water for the trip. We stayed the night at Xianfeng, which had an accommodation price list posted showing prices between 60¥ and 300¥, presumably for styles of rooms or beds that we couldn’t discern as it was all in Chinese. The employees pointed to the 140¥ (~$21) line, which we figured was at least slightly short of highway robbery. It turns out they wanted this price per person (! ), but after we pointed to the cheaper lines they simply shook their heads, with no further explanation. Quoted prices vary from source to source as well, with some claiming that you can get a bed at a monastery for as little as 40¥, but maybe that’s just for locals. We were able to talk them down a bit by threatening to leave, but this was little consolation. In any case, we were given a dingy room with no windows and damp, bedbug-ridden bedding, which we would have been happy to receive for a smaller price. At least the 05:30 wakeup from gongs and chanting monks was better than the toothbrush salesman on the train. Xianfeng Monastery, where we spent the night. All in all, our hike was about 20km, descending about 1800 meters from the base of the cable car at 2500 meters to Wuxian Gang at 700 meters. 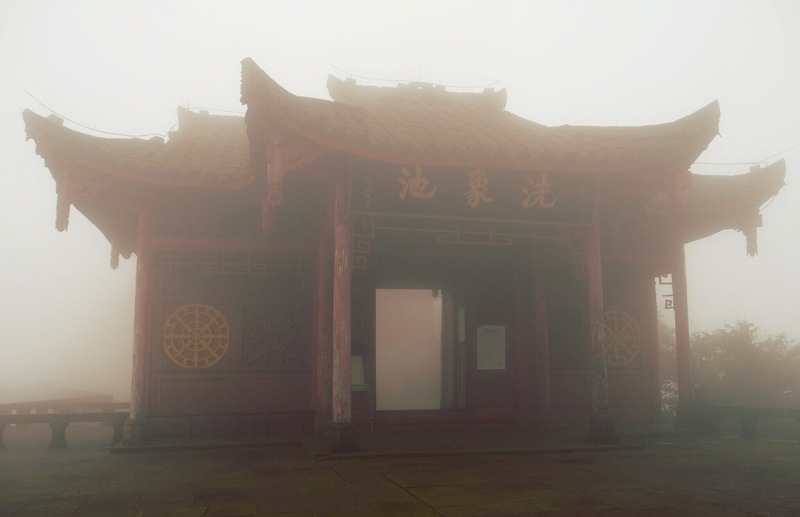 Unfortunately, we were afforded the typical view from the summit, which is heavy fog with very little visibility. Still, the temple at the top was pretty cool. The visibility became better the lower we got, but it was still pretty foggy all around. We managed to stay dry most of the first day, but the second day was fairly constant rain. The monkeys are a problem at the park as well, they can be aggressive and gang up on hikers in groups, but they’re more likely to rifle through garbage bins or bags left unattended. 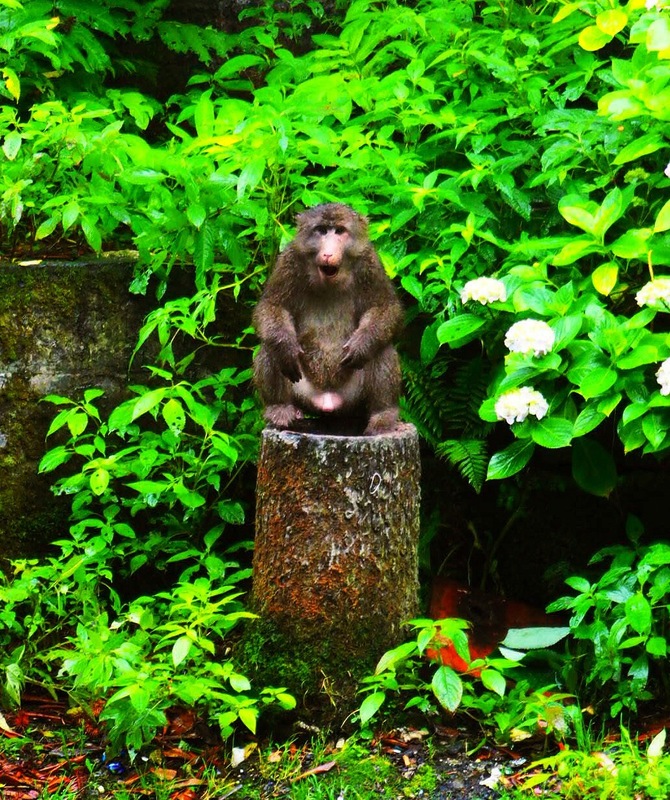 We, like many others, carried bamboo sticks to ward off any errant monkeys. We ran into several big groups of them, and were fortunate to get away unscathed, but passing by them was certainly nerve wracking. Watch out for this tough guy. 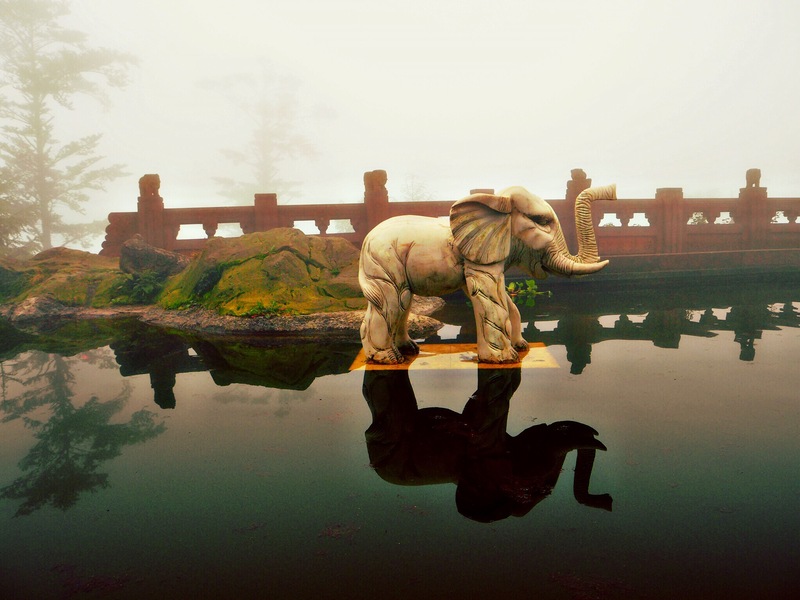 Solitude is not easily found at Emeishan. The top and bottom, being as accessible as they are, are completely overrun with tour groups. However, the more challenging middle stretches of the path (between Lei Dong Ping and Hong Chin Ping) are mostly empty. Challenging they are indeed, as well. It may sound like hiking down would be a cinch, but it’s basically like taking the stairs down four Empire State Buildings stacked on top of each other and after just a few kilometers the legs become painfully aware of all this elevation change. One of the many flights. Unbelievably, human labor seems to be the primary means of getting supplies to where the roads don’t reach. 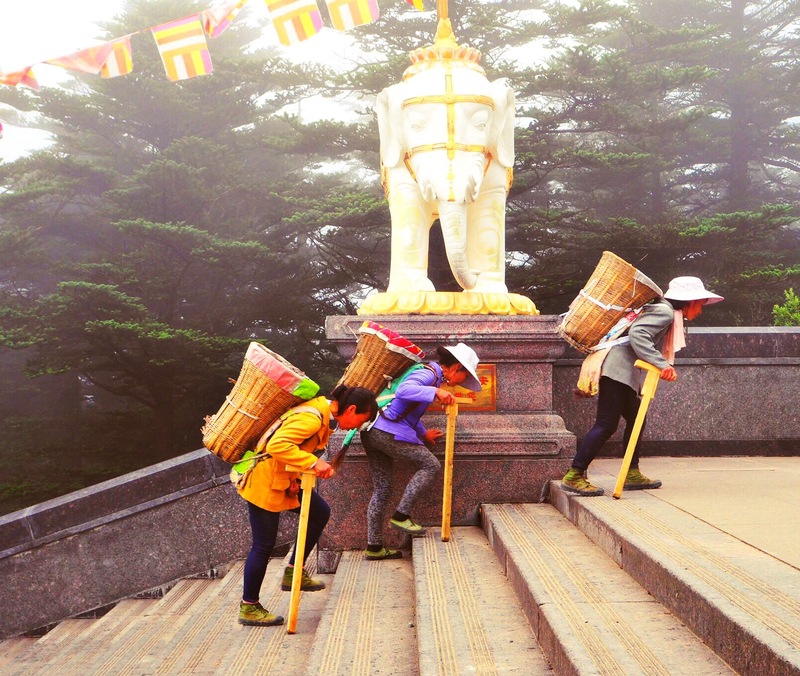 The area around the peak was under renovation when we were there, and scores of women and men, mostly quite elderly, were carrying giant sacks of gravel and concrete on their backs from the parking area to the summit (more than 1km of steep stairs). They would take breaks on the flat areas before continuing their slog up to the construction zone. We saw the same technique for food and drinks to the restaurants, which had us respecting our first sip of cold beer at the restaurant near our monastery a bit more. Women carrying concrete to the summit. We finally made it to Chengdu, which was not an easy task either. Our expectation was a painless ride on the high speed train from Emeishan Station directly to Chengdu, as per the hostel staff’s assurances. Instead, we waited in line at the train station, only to be told that the trains were fully booked until about nine hours later (as per our suspicion). We bought tickets anyway, only to realize we really didn’t want to wait around for nine hours in a rainy Emeishan, so we promptly waited in line again to cancel the tickets and look for another way. After a weird ride on several local buses, with many locals corroborating our chosen route, we made it to a bus station (not the station we thought we were going to, however) and bought tickets for the next bus to Chengdu. The woman behind the counter said the bus was leaving in 13 minutes, but our printed tickets said it was leaving at 18:00 (five hours later). At first, the staff manning the gate to our bus told us to have a seat, and hand-motioned something about how we were not going to get on the bus waiting right outside. After a frenzied attempt at figuring out what was going on, we were finally ushered aboard to take the last two available seats. We’ve settled in now, and are looking forward to seeing all that the capital of the Sichuan province has to offer! Another view on the way down. 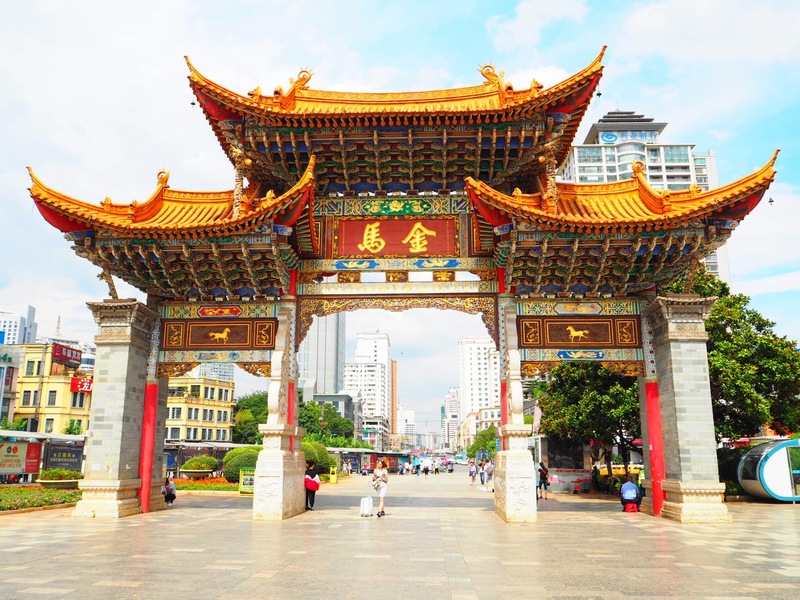 While most people consider the language of China “Chinese”, or even if they maintain a distinction between Mandarin and Cantonese, the situation is actually quite different. Mandarin, as the primary language of China, has a number of very different dialects, with some of them differing as much as the various branches of Romance or Germanic. Needless to say, the native dialect of a person from Kunming is not mutually-intelligible with that of a person from Beijing or Harbin, for example. MSM, or Modern Standard Mandarin, which is based on the dialect of Beijing, acts as a lingua franca between people from different regions of China, so most people from a non-central region speak both their local dialect in addition to MSM. To complicate matters, there are nearly 300 other languages spoken (to differing degrees) in China by ethnic minorities including many Mongolic, Tungusic, Turkic, and Tai-Kadai languages. The Sino-Tibetan language family is well-represented in China with languages of many primary branches being spoken in addition to Mandarin and Tibetan. Great description Ian, certainly more of an adventure that I’ve had, but you captured the essence of China perfectly! 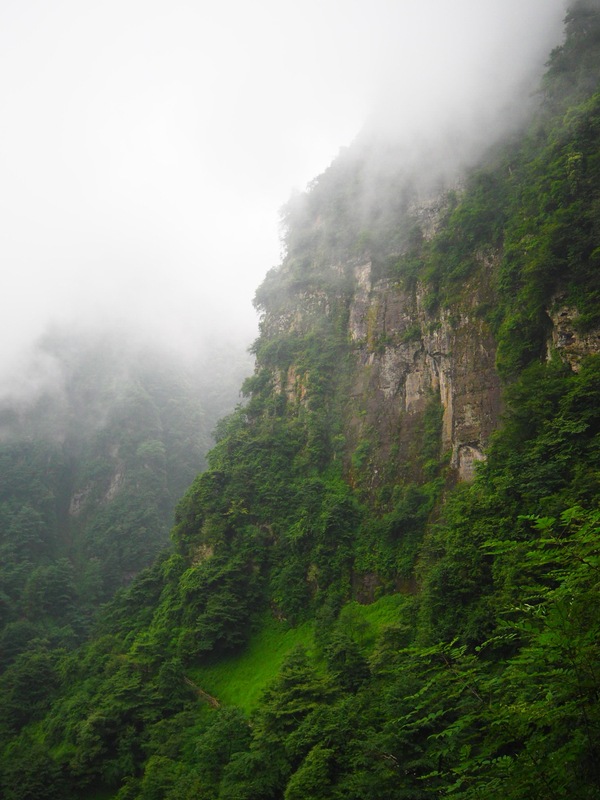 Pingback: China: Zhangjiajie and Shanghai – Sometimes the wrong train will get you to the right place.